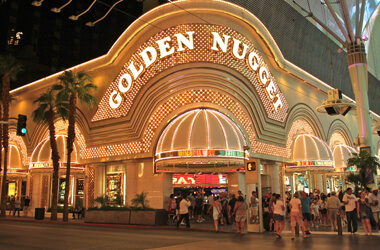 The Golden Nugget is one of the many sportsbooks you can find in Downtown Las Vegas. Find out where the rest are from Marc Meltzer. If you follow me on the social media then you probably know I spend a good amount of time in downtown Las Vegas. I spend a lot of time in the casinos close to where I live but when I’m looking for a Meltz day and/or night away from home it’s usually in downtown Vegas. It’s only 10-15 minutes away and it allows me the illusion that I can still enjoy the Vegas Strip as a tourist when friends visit. The casinos in downtown Vegas are older buildings and are less opulent than the casinos you’ll find on the Vegas Strip. Some of the properties are so small that you won’t even find a sportsbook (GASP!). You won’t find a book at Main Street Station or the Golden Gate. You’ll find a sports bar and restaurant, called 777 restaurant and microbrewery, to watch the games at Main Street Station but you’ll be directed to the California to place wagers. Plaza - This is one of the largest spaces for a sportsbook in downtown Vegas. They have newer HDTVs to serve as screens and ample seating. Like most books in downtown Vegas this is a William Hill operation so you may have to place a small wager ($2 minimum) to watch the games. The sportsbook has cocktail tables so you can get a pie at Pop Up pizza and enjoy it while watching the games. That's not something you can do at most sportsbooks. Binion’s - This is an underrated sportsbook in a historic casino. The book is one of the larger spaces but it's towards the back of the casino where you might not visit unless you were looking for it. 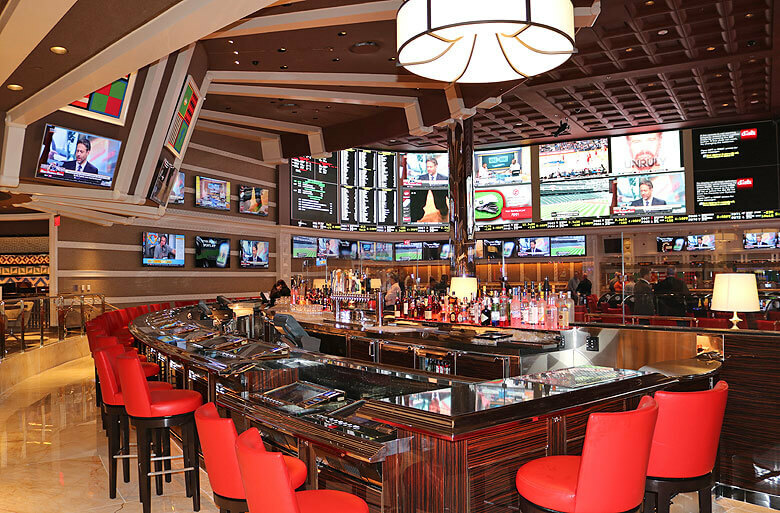 There are lots of TVs and seating for both horse and sports bettors. Its proximity to Benny's Smokin' BBQ & Brews is a nice option for beer drinkers. California - The sportsbook has ample seating and 15 TVs in various sizes but it’s almost feels as though you’re sitting an old school room not a sportsbook. It’s fine if you’re looking for a mellow spot to hang out for a while or a place to kill time. If you’re looking for action you might want to make your wagers and head over to Main Street Station and watch the games at 777. 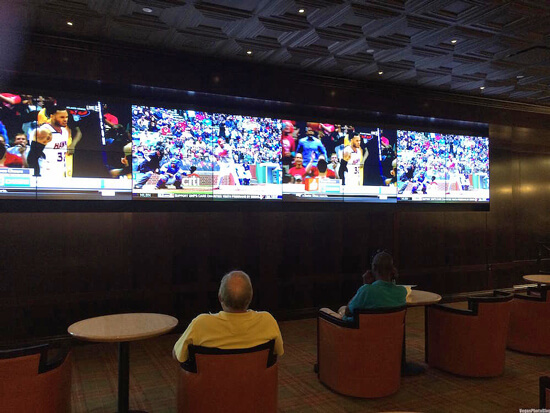 Downtown Grand - The newest sportsbook in downtown Vegas has a large wall of screens that can be configured to show a variety of games. The screens can be divided to show up to 20 games or be consolidated to focus on four major games on larger screens. During football season they have excellent specials that include $1 draft beers, $2 hot dogs, $3 brats and $3 hamburgers until 4 p.m.
El Cortez - You might not believe me if I told you that an L-shaped sportsbook layout makes sense but it does. One side of the “L” has seating that looks at horses while the other side shows sports. There’s limited seating here and it’s only available to higher-tier players club members on busy days. 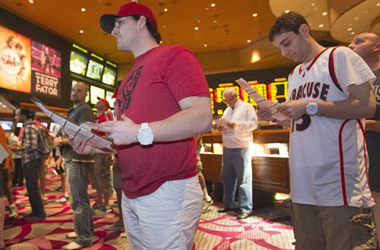 This is the only sportsbook in downtown Vegas operated by Station Casinos. 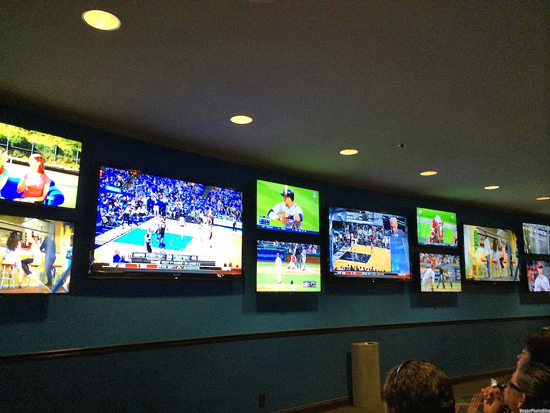 Fremont - The sportsbook is tucked away in a corner of the casino and is a nice place to watch the games away from the action. Like Binion's if you're not looking for the sportsbook you may never know it was here. They still have traditional horse tables with the seats so you can put any game on your personal TV. There’s a bar just a few feet away from the seats so you’re always a few steps away from a nice inexpensive cold beer. Four Queens - I've been to this casino hundreds of times and have never seen the sportsbook. It’s tucked away from the action and seats 15 or so and is surrounded by slot machines. Golden Nugget - The Golden Nugget is one of the most luxurious casinos in downtown Vegas and you see that in the sports book. The wall of screens is unlike any you’ll find in the area. The seating options are also unique with booths, tables and chairs. You’ll also find the only independently operated book in downtown Vegas.